In the last week, X1 crashes every time I bring my PC out of sleep. It may or may not be related to a new 4K monitor I purchased (that is the only change my PC has had in the past week). I get the "Cannot set Owner to a Window that has not been shown previously" error (see attachment). I then have to restart X1. 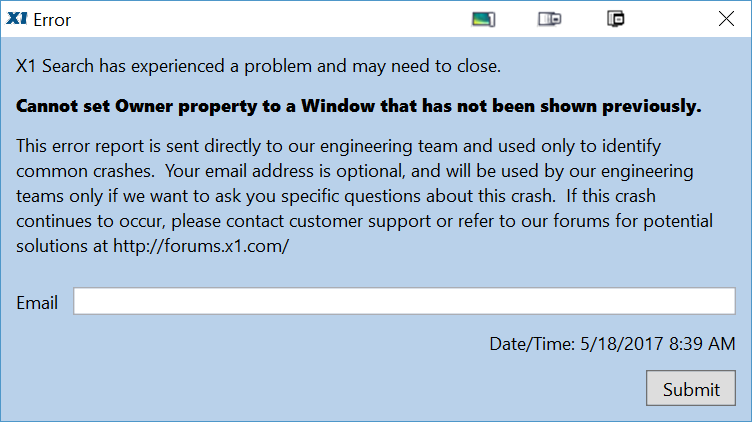 Trajan wrote: In the last week, X1 crashes every time I bring my PC out of sleep. It may or may not be related to a new 4K monitor I purchased (that is the only change my PC has had in the past week). I get the "Cannot set Owner to a Window that has not been shown previously" error (see attachment). I then have to restart X1. Same error here for the last 10 das or so. I have sent the error Email several times. It's a nuisance. Is there help in sight? I get the same error message when I boot up every day and have submitted my email address on the popup screen each time; I have yet t receive a reply. "Unable to complete setup due to an unexpected error. Please see logs for details." There is no meaningful information to me in any of the logs, and nothing in the release notes that is helpful. I too am suddenly seeing this for the past few days. The result of a Windows update maybe? Is that by allowing X1 to install the update? Or did you get the link from the page that announces the new version? After opening the application, a "Product Update" screen opens and announces an application update to version 8.5.1. I check the box on that screen to select the update and then click "Install" at the bottom of that screen. This initiates the installation process which quickly terminates prematurely with the resulting error message "Unable to complete setup due to an unexpected error. Please see logs for details." I then click "OK" and "Exit" to quit the installation process and begin using the current version 8.5 6001qm (64-bit) on my laptop running Windows 7 Enterprise (x64) Service Pack 1 (build 7601). This issue stems from a bug we fixed in 8.5.1. When "Start X1 when I start Windows" and "Start X1 Minimized" are selected, AND there is an updated version of X1 Search available, Search attempts to show the update prompt prior to the UI being launched which crashes the application. To resolve this, please disable "Start X1 when I start Windows" and upgrade to 8.5.1. You should then be able to upgrade to 8.5.1 and return to normal functionality. jbrentin wrote: After opening the application, a "Product Update" screen opens and announces an application update to version 8.5.1. I check the box on that screen to select the update and then click "Install" at the bottom of that screen. This initiates the installation process which quickly terminates prematurely with the resulting error message "Unable to complete setup due to an unexpected error. Please see logs for details." Have you opened a case with our customer support team? They may be able to resolve this issue in short order.